It's been several years since AMD's last big PC product announcement, but today in Hawaii the company announced several new cards based on their latest GPU architecture. Having achieved a veritable coup by providing the essential technology underpinning both the Xbox One and PS4, AMD underscored its commitment to PC gaming today with its latest flagship GPU, the Radeon R9 290X. 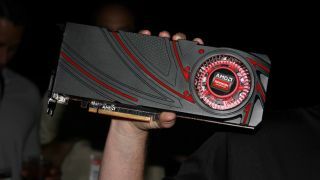 In addition to the flagship Radeon R9 290X graphics card, AMD announced a top-to-bottom line of graphics cards that it believes offers something for every gamer. The Radeon R7 250 is an $89 part that boasts 1GB of DDR memory, and according to AMD is able to achieve 3DMark Firestrike scores greater than 2000. The Radeon R7 260X sports 2GB of DDR memory, exceeds 3700 in 3DMark Firestrike and will be priced around $139. Following the R7 250 and R7 260X are the R9 270X and the R9 280X. The R9 270X is a $199 card replete with 2GB of DDR memory that is capable of exceeding 5500 in 3DMark Firestrike. Finally, there's the R9 280X, a $299 card with 3GB of DDR memory that scores more than 6800 in 3DMark Firestrike. Last night on board the USS Missouri, AMD's Matt Skynner showed off the card. While details are minimal, a few things jump out at us. Notably, the Crossfire connectors are gone. Crossfire will now be handled via PCI Express. Additionally, the Radeon R9 290X will sport two DVI outputs, a DisplayPort output, and an HDMI output. A closer look at the card raises more questions than answers.